It’s been almost a week since my last post, but it was an intense work week in the Pacific Northwest, that, combined with a bad case of jet lag, left no room for blogging or venturing out with the camera. 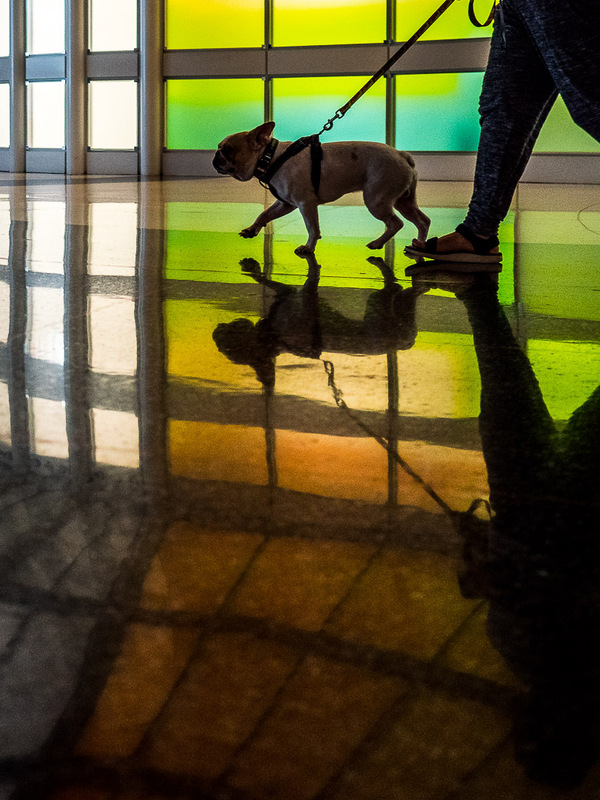 I had to wait until my return trip to Nuremberg to put the PEN-F and the mZuiko 17mm F/1.8 to work, albeit in one of my favorite connecting locations, Chicago’s O’Hare airport. 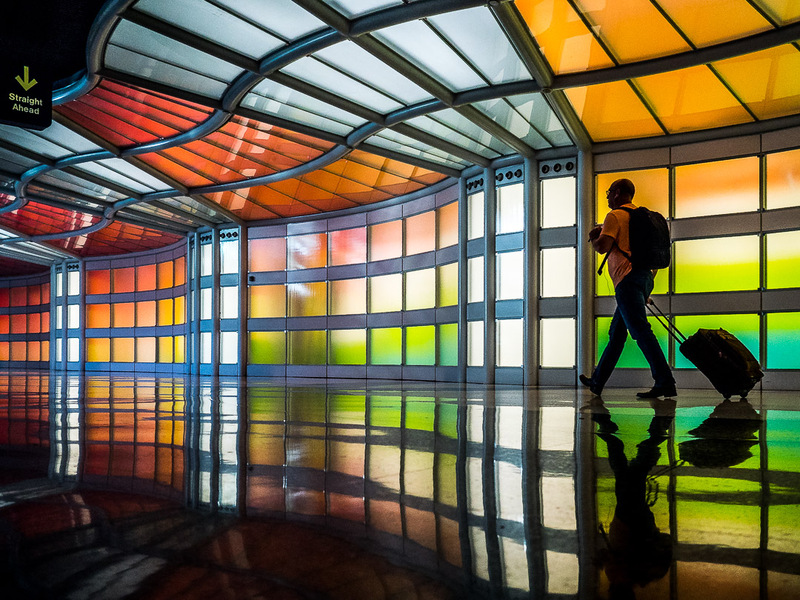 The colorful tunnel between concourses B and C of ORD Terminal 1 is a great place for some street photography. For a few more photographs taken yesterday continue after the jump…. Instead of my usual NUE-AMS-PDX flight with KLM and Delta I was booked NUE-FRA-SFO-PDX on my flight to the Rose City on Monday and PDX-ORD-FRA-NUE for my return flight that started yesterday early morning and got me back home in time for a Saturday breakfast with the family. This routing held several caveats, with significantly longer travel time (I was en route for 21 hours) and having to fly with United Airlines. They are so far behind Delta Airlines, both in quality (or rather lack thereof) of their product, as well as staff friendliness. I flew four legs with them, both in older and newer planes, and it was consistently bad. On top, on both transatlantic flights, I was blessed with sleepless little babies in the seats next to me. It was much worse than it sounds. Not really for me (ever heard of noise cancelling in-ear headphones? The top must-have-accessory for the frequent flyer!! ), but for their mothers, desperately fighting to put them back to sleep (and probably making it worse), and the neighboring guests without headphones. Oh, I watched Isle of Dogs on the flight back, really liked this animation film about a group of dogs who helps a young boy searching for his dog after the whole species is banished to an island after a canine-flu outbreak. Well, being limited to the 17mm lens I experimented a bit with wide-angle shots of the tunnel, as well as a few close-ups of the passing passengers. 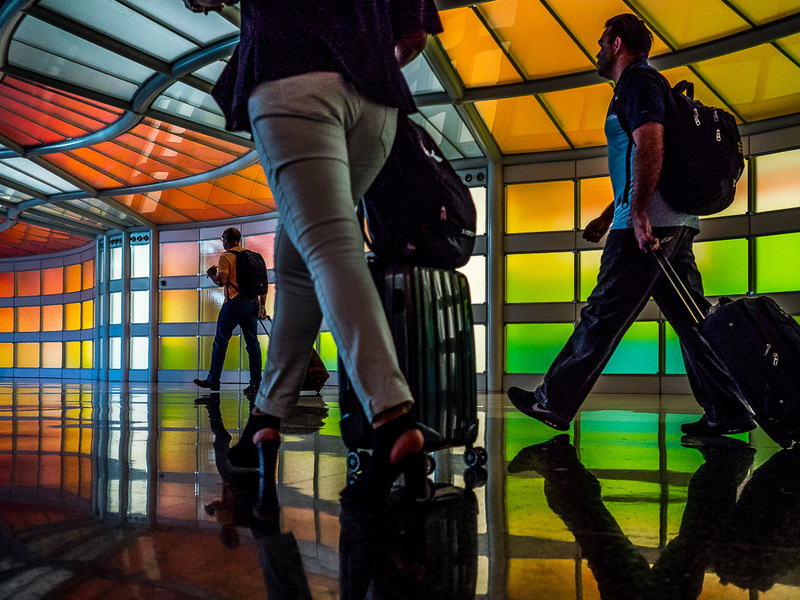 Airports are great places to shoot, people generally are in a rush and don’t pay much attention to the photographer crouched down between their legs. At least I got to do a creative workout before the nightflight across the Atlantic and back to Frankfurt. I’m looking forward to a beautiful summer weekend and two weeks back home on the Streets of Nuremberg before once more returning to Portland for a week. Will have to catch up with all your comments and blogs. Thanks For Your Information and Posting, Thanks a Lot! Love the photos especially the fog and reflection. love the colorful photos. Its amazing post. Awesome post. And your Photos are also nice. Are you a photographer too? What striking pictures – amazing eye. Thanks for stopping by our blog! 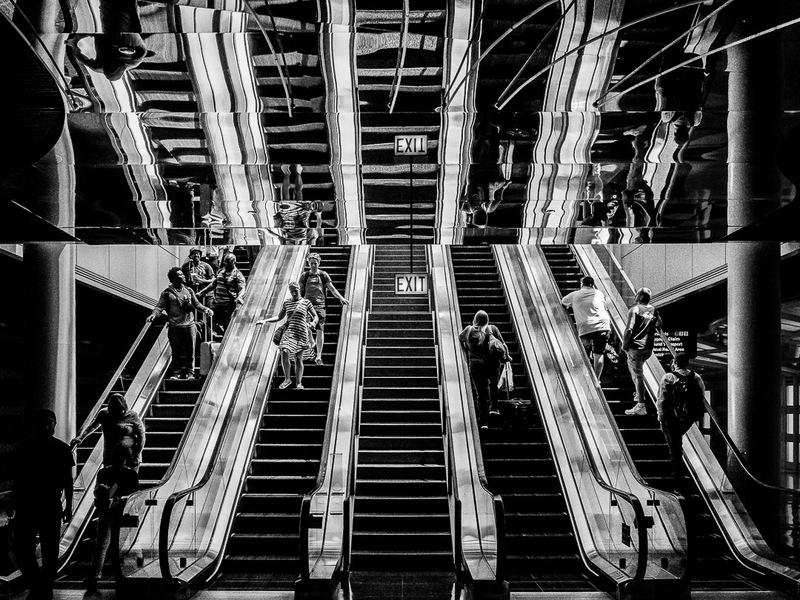 The colored ones are great and that black and white escalator photo- so cool! lovely pics. Loved the colors. Fantastic pics. The colourful backgrounds are representing the art of photography. Kirstenstokes.com subscribe to it and learn about life and more! At least you got awesome, very colorful photos out of the experience!!! Welcome home and love the photos. Great shots, Marcus! I’m always reluctant to pull out my camera in airports (for fear of being detained and questioned) … but you have me rethinking that stance. These photographs are just absolutely crazy artistic. Love it!!!! 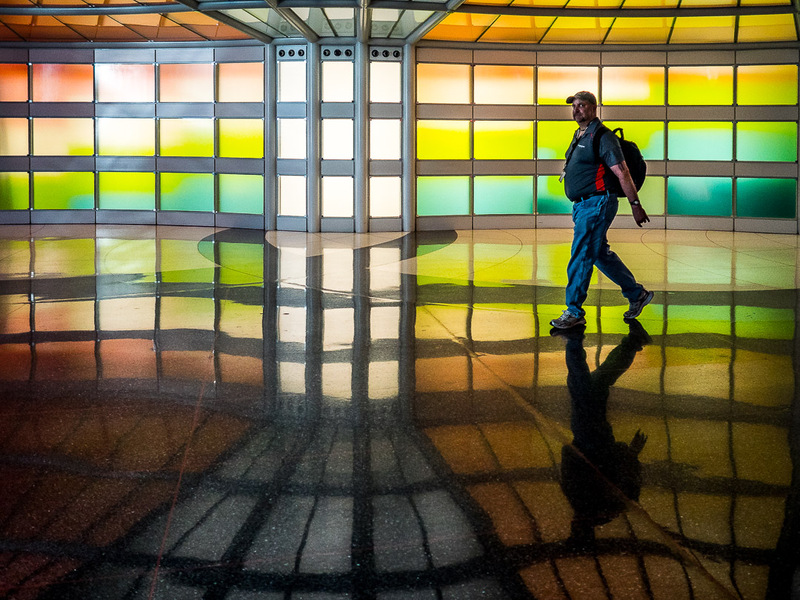 O’Hare airport is huge, yet I like it when one has to kill lots of time between connection flights, so much to walk around, especially the little botanical garden at one end, is great. Fabulous photos and yes – noise cancelling headphones are a must for any flight!! 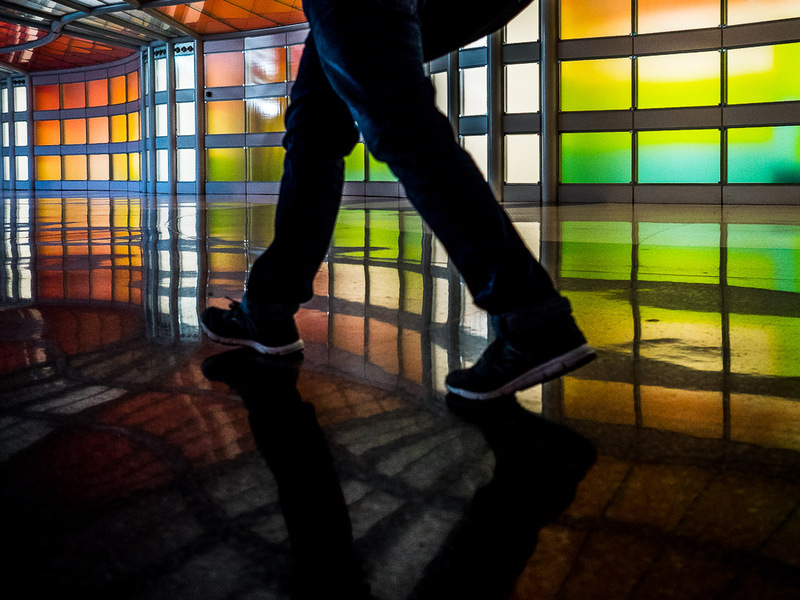 Love the colourful photo of the passengers walking through the terminal Marcus! Such wonderful photos! I would not have thought to crouch down at an airport, with it being so busy and all. But that is exactly your point–they are too busy to notice the photographer. I cannot wait to try this! Thanks for the great tip, Marcus. All are great shots but the black and white one is fantastic! You are welcome Marcus, have a nice Sunday.